beauty of the Cotswolds can do so. 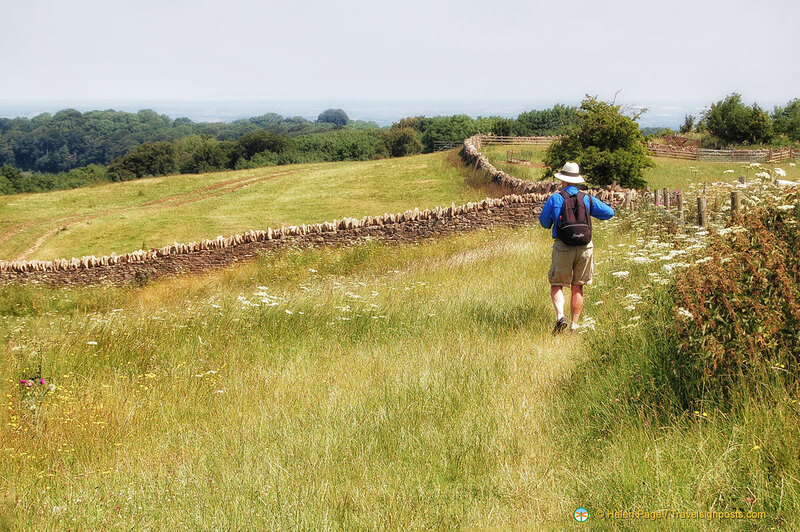 The great thing about walking in the Cotswolds is that it is possible to do a small day walk or any number of days, depending on the time you have available and what kind of walking holiday you’re after. Due to a late change in our travel plans, we had a week to spare in England and so we did a one-week circular walk which started and ended in Moreton-in-Marsh. Our priority was to enjoy a walk in the Cotswolds and see places, and we were not looking to break any walking records. The itinerary for our walk was put together by Andrew Guppy of Cotswold Walks, a company that has been arranging Cotswold walking holidays for visitors for twenty years. Andrew also organized our accommodation, baggage transfers and provided comprehensive notes and instructions for our walk. This was our first Cotswolds walk and the weather was nothing short of brilliant for the entire week. The unusual English heatwave, one of five in the last 100 years, meant that by mid-day we were walking in temperatures of about 30C. Although it was hot, we much preferred this to walking in the cold and wet and our photos turned out brilliantly. The above Cotswold Way itinerary takes walkers through the most beautiful English country-side and unspoilt and historic towns and villages. The scenery changes constantly and one moment you could be walking through fields covered with brilliant yellow rapeseed flowers and the next you could be walking amongst sheep grazing in paddocks. Being the height of summer, crops of wheat, barley and tasty broad beans – yes we tasted a few – were well on their way to producing the season’s harvest and for city folks like us, it was thrilling to be walking amongst these magnificent fields. The wild flowers in their summer bloom also added colour to the walk and bushes of wild angelica with their white flowers lined much of the route. Our Cotswold Way walk was also almost like a treasure hunt as we were continually looking out for field gates, kissing gates, climbing over stiles and looking for our next Cotswold Way signpost. We were very grateful to have Andrew’s detailed notes and instructions to help us find our next clue. The walks through wooded areas provided nice relief when it got hot, as did the cold drinks at the local pubs. And the Cotswolds is not only about views, we got to stop at historic sites like Hailes Abbey and Sudeley Castle, once home to Katherine Parr, the last and surviving wife of King Henry VIII. The end reward of the day was to finally arrive at the beautiful and typically Cotswold villages and towns of Bourton-on-the-Water, Winchcombe, Broadway and Chipping Campden. The B&Bs booked by Andrew were of a high standard and without exception they all provided a ‘hearty’ English breakfast to set you off for the day’s journey. For non-meat eaters like us, there were cereal, bread, fruit and yoghurt to provide energy for the walk. The standard of restaurant and pub food in the towns and villages where we stayed was also very good and we had some nice Italian food and a great curry. The curry chef at the Noel Arms in Chipping Campden did not disappoint. He is a three-time winner of the Great British Pub Awards Best Curry Chef, and his curry was excellent. There is certainly more to Cotswolds dining than just fish and chips or steak-and-kidney pie. And of course Tony enjoyed his English ale. The nice thing about walking in the Cotswolds is that you don’t have to worry about your luggage and this is transferred to your next destination every morning. This service was organized for us by Cotswolds Walk. If you’re coming from London as we did, First Great Western trains run from London Paddington to Moreton-in-Marsh. The Moreton-in-Marsh train station is about a 5-minute walk from the village centre and if you don’t have heavy bags, it is possible to walk into the village.